Warner will make his IPL comeback on March 24. Australia staged a remarkable comeback in the recent ODI series against India. After trailing by 0-2 in the five-match series, they ended up winning it by 3-2 to create history. India experimented a bit in the last three games but that doesn’t take anything away from the visitors’ gigantic efforts. They rested MS Dhoni to test Rishabh Pant behind the stumps and this is where the Men in Yellow sniffed a chance according to David Warner. 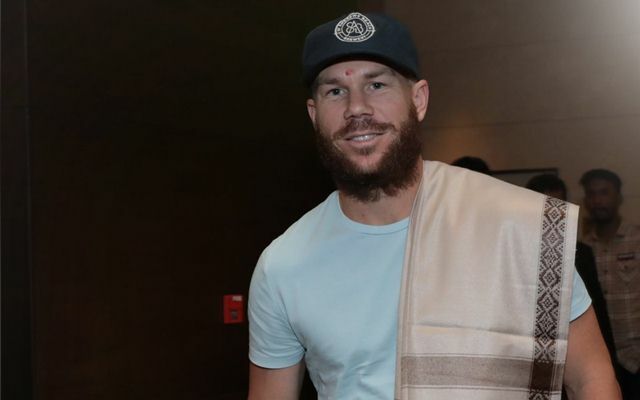 The 12-month ban for the cricketer is about to end next week and though he has not been included in the ODI squad for Pakistan series, Warner and Steve Smith met the team in the UAE. On their way to India to play in the Indian Premier League (IPL), the duo interacted with the players to get used to the environment. While speaking to India Today ahead of the IPL where he will play for the Sunrisers Hyderabad, David Warner felt that MS Dhoni‘s absence played a part in India’s series defeat. He also stressed the impact of a player like him and how his presence can make the difference. “We know MS wasn’t playing the last couple of games and you know from the Australian point of view, I thought ‘that’s a big gap, a big hole and we’ve got a chance’. That’s the impact one player like him has from an opposition’s point of view. These are the headaches a lot of teams will have when they are selecting their 15,” David Warner said. The southpaw is now gearing up for some top-level cricket after a long time. He will take the field after a one-year hiatus from the IPL on March 24 against the Kolkata Knight Riders (KKR). Moreover, IPL performances is also the gateway for him to Smith to make a comeback to the Australian team for the World Cup.